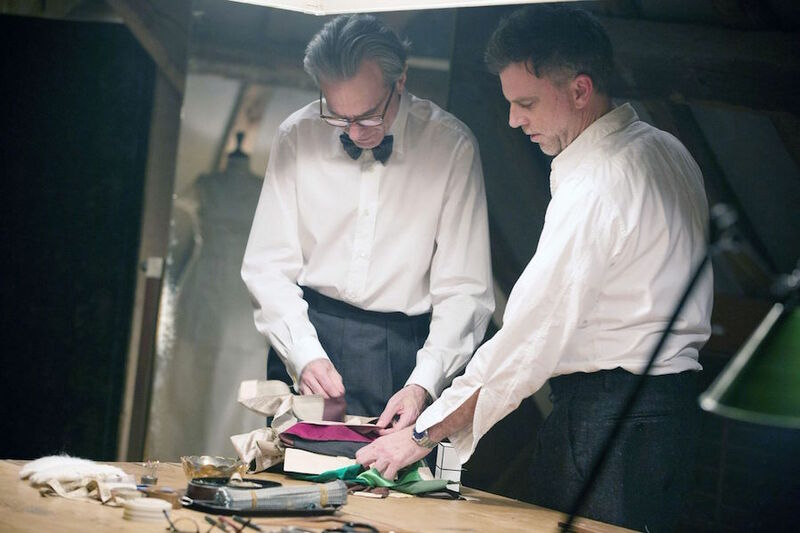 Phantom Thread took away an Academy Award and a BAFTA for Best Costume Design this year; we find out what makes it so deserving. 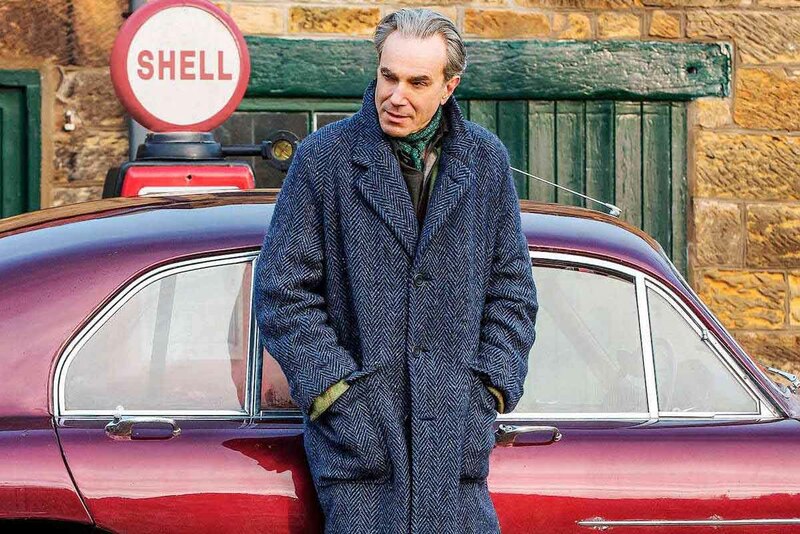 Daniel Day-Lewis as Reynolds Woodcock wearing a bespoke raglan sleeve overcoat with large patch pockets in a herringbone wool by W. Bill, and made by Anderson & Sheppard. Phantom Thread was released on Christmas Day, 2017. Reportedly Sir Daniel Day-Lewis’ parting gift to the world of cinema, it came wrapped in swathes of silk and lengths of ribbon and hand-delivered by director Paul Thomas Anderson. The trailer tantalised with intimate close-ups of a couturier’s handiwork, electric tension between characters and the promise of a dangerous liaison. 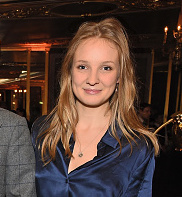 Alongside Vicky Krieps, who plays waitress-turned-muse-turned-lover Alma, Day-Lewis plays Reynolds Woodcock. A renowned couturier in post-war London with a personality that sets one’s teeth on edge, he’s a flawed genius whose manner swings from particular to petulant to cruel. But, like many of the most unpleasant men in cinema – American Psycho’s Patrick Bateman or A Streetcar Named Desire’s Stanley Kowalski – he is also one of the best dressed. Unlike Bateman’s rigid Wall Street uniform and Kowalski’s barely-there workwear, Woodcock’s carefully selected wardrobe is quietly elegant and pointedly British. Inspiration came from research into a handful of rakish designers ­– Hardy Amies, Digby Morton and Cristobal Balenciaga – as well as Day-Lewis’ father Cecil. Cecil was a loyal patron of Anderson & Sheppard, and Woodcocks’ overcoat pays homage to him. “We’re not known for doing a raglan sleeve,” says Cutter Leon Powell, “so that was a challenge. He brought a photo in of his father wearing one and said he liked the style.” It’s likely Day-Lewis knew that a raglan is the perfect coat to wear over a suit – there is no seam in the shoulder, so it doesn’t crush the suit seam, and it hangs loose so as not to crease the tailoring; the sort of details only an obsessive couturier would notice. “One thing you won’t see on screen,” Martin reveals, “is the name stitched into the lining of his breast pocket. We always do this with bespoke orders, but here we made a special case: on one side, it has ‘Daniel Day-Lewis’, and on the other side, ‘Reynolds Woodcock’” – a subtle bespoke touch and an Anderson & Sheppard signature which attests to the attention to detail applied in the film. The tailoring itself has generous drape – a combination of the house cut and period authenticity – wider lapels, high armholes and a soft, natural shoulder. One of the more charming scribbles in Crawford’s notes from his original meeting with Bridges reads ‘Phantom Fred Thread’ – “We had no idea what the film was about at that point,” he chuckles, thinking back to 2016 when the process began. Daniel Day-Lewis requested all the tailoring be completed three weeks before filming, so he could wear in the clothes and get into character. He chose the fabrics, attended fittings, took Bridges shopping in London (Drake’s and Hilditch & Key were also paid a visit) and even got involved with the rest of the cast’s wardrobe. His immersion into the process and Bridges’ 30-odd years in the business evidently paid off, and last week the film won the BAFTA for Best Costume Design. Anderson & Sheppard has already received orders for imitations of the overcoat, and no doubt Budd’s purple PJs will be a best-seller this year; Phantom Thread might be a period film, but it’s timelessness has the potential to become a point of reference in menswear for years to come. Daniel Day-Lewis and director Paul Thomas Anderson working together.